Editor's Note: Voting for the Elite Eight is closed, but you can get in on the Final Four right here. The Round of 16 is officially in the books for our first-ever San Francisco Neighborhood Tournament, and after one first round upset (you go, Glenn Coco-Dogpatch! 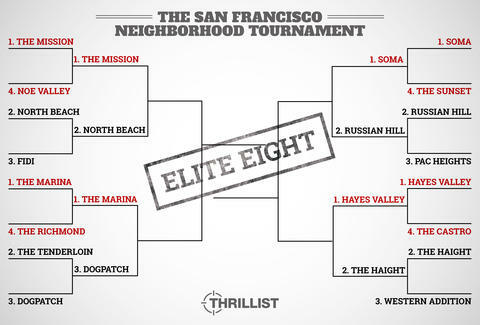 ), we're left with the Elite Eight that're still in the running for SF's Best 'Hood. Will D-patch continue its Cinderella run? Will any of the top seeds fall? It's all up to you, so get to voting before the polls close at 6pm PST, and check back in tomorrow for the Final Four.